When you’re looking to create an elementary or middle school yearbook that speaks to the masses, it can be tough to find that perfect blend of content. While you work hard to find ways to include every student on the pages of your spreads, there’s no guarantee that every individual will actually engage with your content. I’m here to help you out of that confusing conundrum with a great idea for an interactive yearbook feature that every student on your campus will love. And if that just piqued your interest, then you’re going to love what’s below–because I’m sharing three ways you can use a super fun fill-in-the-blanks feature to make your yearbook design shine! A concept that’s used for fun car rides and classroom quizzes alike, it’s no surprise that your students love to answer fill-in-the-blank questions. It gives them an opportunity to show off their knowledge, or get a little silly, depending on the context. 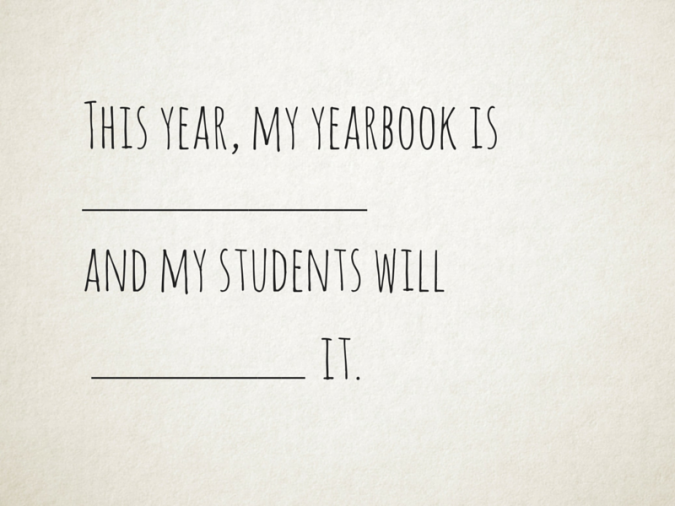 Because it’s extremely adaptable and your students already know what to do, this makes a fill-in-the-blanks feature perfect for your yearbook. Start with a page that allows them to document the basics of their school year. This first page should encourage students to share what grade they are in, what their favorite class was this year, and what they like to do outside of school. Because friendship is such a huge part of student life at this age, ask them to write about what they do with friends. You could even encourage your students to fill in a few more specific details about their hobbies. This is the kind of stuff they’ll look back on fondly in years to come, serving as a reminder of what was important during this particular year of school! To get the maximum impact from your fill-in-the-blanks feature, you want your students to have a lot of fun with it. And there’s no better way to do that than by asking them to put their English skills to work, creating school-specific Mad Libs that they can fill in with their friends! A favorite game for language building and summer road trips, this is a fun, interactive way to get your students engaged with your yearbook design beyond the traditional signature pages. If you have room, you could even build a few of these pages throughout the content of your book. This way, you can focus each exercise on different sections of content. For example, students could craft a story about a silly day in gym class or depict their favorite field trip of the year. You could even incorporate a fun Mad Libs style activity that compares and contrasts the first and last days of school! This can help more of your students find a fill-in-the-blanks page within your book that aligns directly with their own interests, which can make your feature fun for everyone. As you’re building out a fun or silly word game for your students to play with their friends, don’t forget to keep your fill-in-the-blanks feature consistent with the rest of your yearbook design–and your yearbook theme! Use language that speaks to your overarching concept. For example, if your theme is “Unique Perspectives,” you could create a feature that allows your students to share their own thoughts on school work, summertime fun, and their future. Or if you choose a “Learning the Ropes” theme, you could incorporate questions that focus on how they learned both in and out of school over the course of the year. Also, use your style guide to make sure that the look and feel of your feature is in line with the rest of your yearbook design. This way, you’ll create an interactive activity that your students absolutely love, while also keeping your content cohesive across every page!